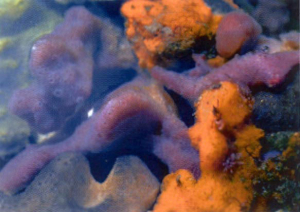 Sponges classify as the simplest group of multi-cellular animals. They do not have tissues and organs but are made up of a number of different types of cell which form the sponge. This structure is held together by spicules of lime or silica. On the surface are hundreds of little pores through which water enters, circulates through the sponge and leaves by much larger openings. Sponge cells filter seawater for food.